Median sale prices in Miami have seen year-over-year increases every month since July 2011. 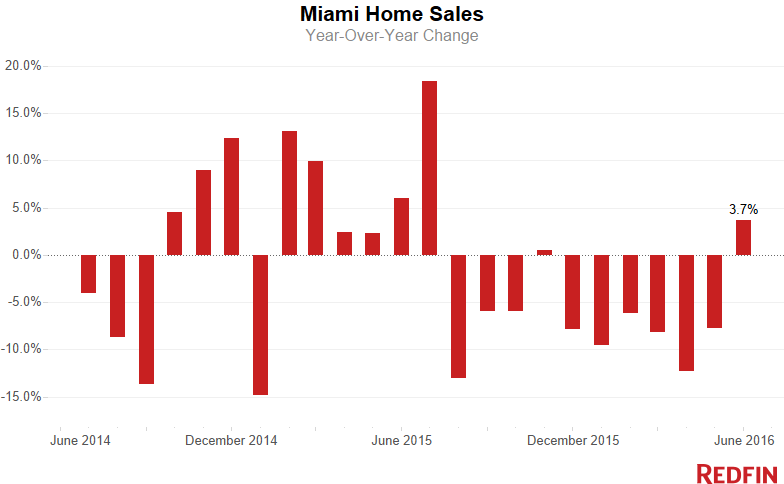 Miami home sales rose 3.7 percent, posting the first year-over-year increase since November. The median sale price for Miami condos was $176,500 in June, down 1.9 percent year-over-year. By Keena Bean; reposted with permission of Redfin. Last month Miami homes hit their highest prices since at least February 2010, when Redfin began tracking the numbers; the median sale price was $260,000, up 7.4 percent in June. 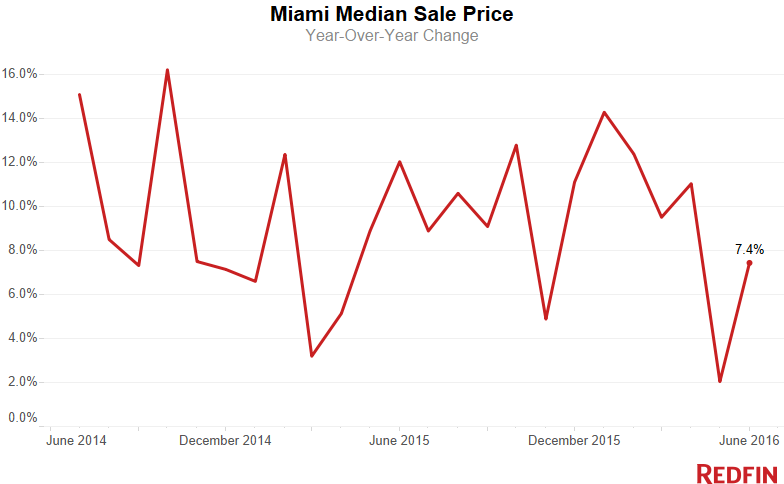 Median sale prices in Miami have seen year-over-year increases every month since July 2011. The number of new homes hitting the market increased 0.2 percent, and the total number of homes for sale dropped 1.5 percent. Homes found buyers 16 days faster than last year, spending a median 51 days on the market in June. The median sale price for Miami condos was $176,500 in June, down 1.9 percent year-over-year. This was the fourth-straight month of year-over-year price declines in the condo market. Condo sales, on the other hand, rose 3.3 percent, posting the first year-over-year increase in seven months. “One of my recent buyers hadn’t planned to purchase a new home quite yet, but since interest rates are still so low, just 3.5 percent, he decided speed up his homebuying timeline and lock in the low rates now while they’re so favorable,” Redfin agent Aaron Drucker said. According to Drucker, some lenders are dramatically lowering their down payment requirements if their underwriting department pre-approves the building. As opposed to the typical 25 percent requirement, some lenders will now accept just 10 percent down for buyers who intend to use the condo as their primary residence, and 15 percent for buyers purchasing it as a second home. “Long-term, consistent price growth has made lenders more confident in the overall market, so they are comfortable utilizing these non-traditional mortgage products for some properties as a way to generate more sales and spur activity,” said Drucker. The number of new condos for sale increased by 4.2 percent, contributing to an overall inventory increase of 6.9 percent. Condos spent a median 71 days on the market, 11 days faster than a year ago. There was a 7.7-month supply of condos for sale in June, favoring buyers. Single-family home prices continued to increase, up 12.3 percent in June to a median $320,000. Prices in this sector have shown year-over-year increases every month since December 2014, and that was the only price decline since October 2011. Single-family home sales rose 8 percent, posting the largest year-over-year jump since last June. There were 2.8 percent fewer new single-family residences on the market in June, and 8 percent fewer single-family residences in total. The total number of single-family homes for sale has shown consistent year-over-year declines since March 2015, and Redfin agents note that buyer demand has outweighed supply. Single-family homes sold 19 days faster than a year ago, staying on the market for a median 44 days in total. 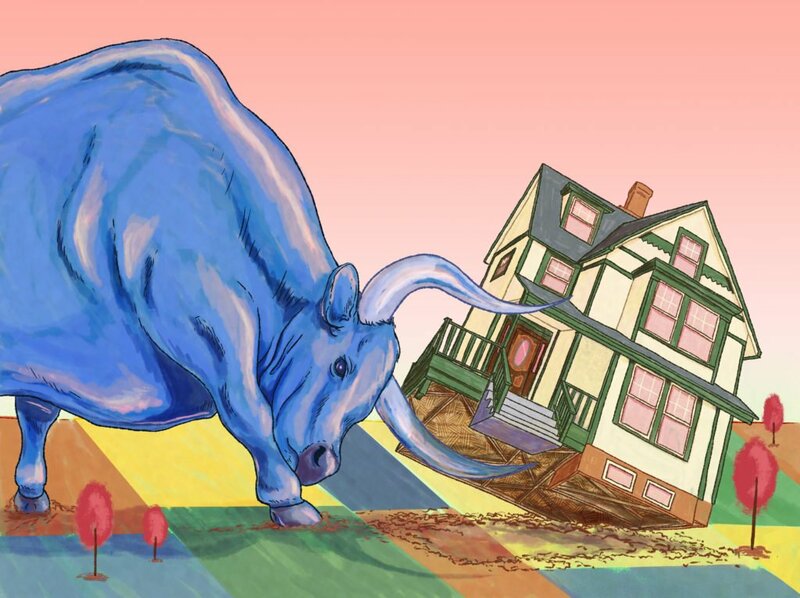 There is a 3.3-months supply of single-family homes for sale — far less than the six months that signals a balanced market between buyers and sellers. Pinecrest fetched some of the highest prices in June, with a median sale price of $985,000. Little Havana was among Miami’s more affordable neighborhoods, with a median sale price of just $166,300 in June. Sale prices in Homestead increased 42.9 percent in June from a year prior, reaching a median $200,000. In North Shore, the typical home sold for $249,000, 27.3 percent less than a year ago. Price per square foot for a home in South Point was $709.97 in June. Even though home prices in Homestead increased dramatically from a year ago, buyers got a lot of bang for their buck: price per square foot in that neighborhood sat at a reasonable $110.56. NOTE: Not all neighborhoods are listed, but totals for Miami encompass the entire city. Data is based on listing information and might not reflect all real estate activity in the market. Neighborhood-specific data is measured over a three-month span that ended June 30. City-specific data is measured over a one-month span that also ended June 30.